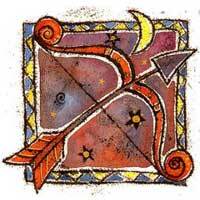 Jupiter and the Moon symbolize the possibility of having a harmonious relationship. It is a case of mutual attraction, although there are some problems, mostly financially speaking. 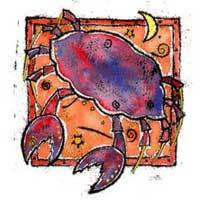 Cancer influences that part of your solar horoscope connected with inheritances, a friend or a partner's money, hidden or weird things. The symbols of your signs, water and fire do not mix, so you are going to have to work really hard to make your relationship work. Cancer is preoccupied by money and safety and you develop an interest in traveling, philosophy, writing and expressing yourself. You will encounter obstacles, but if you are mature enough, you will exceed them. Next to a Cancer you will find variety and change - and you are opened to changes. Cancer will help you in the decision making process and will insist in you putting forward a goal and follow it; he will make you aware of the financial potential. We can speak about physical attraction, but he's counting on you to be the optimistic, happy half of your relationship. You are mysteriously attracted to Cancer; you are fascinated and will try to find out everything about him. You might never get to really know him, but he will consider your attempt to be a true pleasure. Together you have creative ideas. The solution is to decide who is in charge. You might have arguments on financial issues. Cancer wants to keep the money, while you want to extend the business. The equilibrium could be good, but it is important to decide who has the last word. You will be in charge of the funds. Your capacities and the sense to invest are challenged.